My older brother Norman and I were shopping downtown at JC Penney's Department store. The time: 5:336 p.m. and 14 seconds. Panic Swept Over Us. A big jolt. Crack, snap! the building started shaking. Norman and I looked at each other and wondered what was going on. When suddenly, the female clerk jumped over the counter and sprinted away before the real hard shaking started. We heard someone yell, "Earthquake!" Growing up in Alaska, we rode out earthquakes before. However, this earthquake started to sound and feel completely different from all the others. Followed by a huge cracking sound. Worrisome, we both looked up at the ceiling, the lights were swaying back and forth. Perfume bottles, boxes and clothes were falling of the shelves and landing all around us. Normand and I were scared out of our wits. We clutched our hands together as panic swept over us and we started running in search of an exit. This was the absolute worst earthquake we had ever felt. All we had to do was look at each other to know how frightened we were. People were screaming and running and pushing. Ahead of us we saw an exit that would take us away from this danger. Forward, running forward to the exit then before I knew it I was laying on the floor. What happened to me and what had fallen on me? It was a heavy metal post card rack and it had me pinned down on the floor. Completely stunned, laying on the floor looking up and still watching all the chaos, peoples legs and boots as they ran past me. I guess I was yelling for help because all of a sudden Norman picked up the metal rack or someone may have helped him. I don't remember, but I scrambled to my feet feeling shaken but not hurt. Both of us were terrified with all the noise and the rolling floor from the earthquake as we started again for the exit. 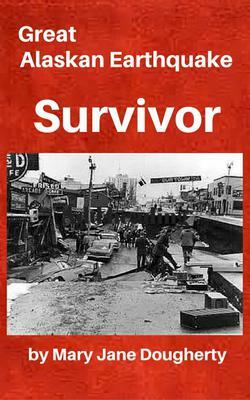 Click here for your FREE ebook "Great Alaskan Earthquake Survivor" right now. Thank You, Mary, for sharing. An excellent description, Mary, of what we all experienced. The worst part is that just outside the Penny's building my friend Lee Stier died as he tried to get the '63 Chevy he had recently received for his birthday to safety. He was a nice guy. He deserved better. Thank you for describing the experience we shared.